Kate and Tom Joy run it, and they do an amazing job to ensure that each of their guests has a once-in-a-lifetime experience. 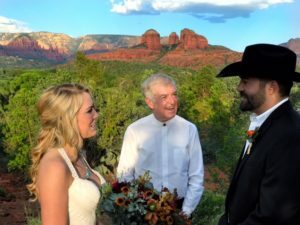 As a Sedona wedding officiant, it doesn’t get any better than this! I officiated Kara and Matt’s wedding just above their casita. You can see how incredible the views are! They’d flown their plane over from El Paso, TX, where they’re from, to get married in this beautiful red rock hideaway.